Directions (1-5): Read the following passage carefully and answer the given questions. Rahul has five different bags P, Q, R, S and T which contains four different colour caps viz. black, pink, red and green. Bag P: Number of pink colour caps is 15 which is 150% of the number of green colour caps. Number of black colour caps is 80% of pink colour caps. One cap is taken and the probability of getting a pink colour cap is 1/3. Bag Q: The ratio of the number of black colour caps to the pink is 5: 6. The ratio of the number of pink colour caps to red is 4: 5. The ratio of the number of red colour caps to green is 3: 1. Two caps are taken and the probability of getting pink and one red colour caps is 120/581. Bag R: Total number of caps is 35 more than the total number of caps in bag P. Total number of pink and red colour caps is 50% of the total number of caps. Number of pink colour cap is 150 percentage of the number of red colour caps. The number of green colour caps is 60% of the number of black colour caps. Bag S: Number of pink colour caps is equal to the number of red colour caps and 5 caps less than the number of green colour caps. Total number of caps in the bag is 5 more than bag P. One cap is taken and the probability of getting a black colour cap is 3/10. Bag T: Total number of caps in the bag is 66 (2/3)% of the total number of caps in the bag P. Number of black colour caps is one-sixth of the total number of caps and is equal to the number of red colour caps. One ball is taken and the probability of getting a green colour caps is 1/3. Quantity I: Two caps taken randomly from the bag S. What is the probability of getting one red and one pink? Quantity II: Two caps taken randomly from the bag T. What is the probability of getting both are pink colour? Number of pink colour caps is 15 which is 150% of the number of green colour caps. Number of black colour caps is 80% of pink colour caps. One cap is taken and the probability of getting a pink colour cap is 1/3. The ratio of the number of black colour caps to the pink is 5: 6. The ratio of the number of pink colour caps to red is 4: 5. The ratio of the number of red colour caps to green is 3: 1. Two caps are taken and the probability of getting one pink and one red colour caps is 120/581. Number of black, pink, red and green colour caps is 20, 24, 30 and 10 respectively. Total number of caps is 35 more than the total number of caps in bag P. Total number of pink and red colour caps is 50% of the total number of caps. Number of pink colour cap is 150 percentage of the number of red colour caps. The number of green colour caps is 60% of the number of black colour caps. Number of pink colour caps is equal to the number of red colour caps and 5 caps less than the number of green colour caps. Total number of caps in the bag is 5 more than bag P. one cap is taken and the probability of getting a black colour cap is 3/10. 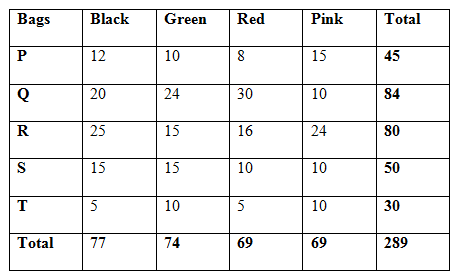 Number of pink, black, green and red colour caps is 10, 15, 15 and 10 respectively. Total number of caps in the bag is 66 (2/3)% of the total number of caps in the bag P. Number of black colour caps is one-sixth of the total number of caps and is equal to the number of red colour caps. One ball is taken and the probability of getting a green colour caps is 1/3. Quantity I: One cap is taken randomly from bag R, S and T. What is the probability of getting a black colour cap? Quantity II: Two caps taken randomly from bag P. What is the probability of getting at least one green cap? 3. In bag Q, 25% of caps sold at 20% discount in which 33(1/3) % is red colour caps. Two caps taken without replacement, what is the probability of getting one red colour cap without discount and another cap with discount? 4. If x green caps taken out from bag S and added to bag T, in the same way 2x red colour caps and x pink colour caps taken out from bag T and added to bag S. One cap is taken from bag S and the probability of getting black colour cap is 1/6. Find the value of ‘x’? Quantity I: Total number of black colour caps is what percentage less than the total number of caps in bag R? Quantity II: Total number of green colour caps is what percentage less than the total number of caps in bag S? Quantity III: Total number of red colour caps is what percentage more than the total number of caps in bag T? Quantity II: Total number of green colour caps is what percentage more than the total number of caps in bag S? Directions (Q. 6 - 10): Each question contains a statement followed by Quantity I and Quantity II. Read the contents clearly and answer your questions accordingly. Quantity I: The shopkeeper sold an article at 10 % discount on marked price and he gains 20 %. If the marked price of the article is Rs. 400, then the cost price is? Quantity II: The shopkeeper marks the price of the book Rs. 350 and his profit % is 15%. Find the cost price of the book, if he allows a discount of 8%? Quantity I: A and B started a business by Rs. 4800 and Rs. 6400 respectively. A invested only 5 months and they divided their shares after a year. The ratio of profit of A and B is 3 : 8. Then how many months B invested the money? Quantity II: P and Q invested in the ratio of 5 : 8. P invested the money for 8 months. The ratio of profit of P and Q is 1 : 2. Then, how many months Q invested the money? Quantity I: Ravi can swim at 10 km/hr in still water. The river flows at 6 km/hr and it takes 6 hours more upstream than downstream for the same distance. How far is the place? Quantity II: A man can row 20 km/hr in still water and the river is running at 8 km/hr. If the man takes 4 hr to row to a place and back, how far is the place? Quantity I: The SI on a certain sum of money for 5 years at 8 % per annum is Rs. 7500. Then the principle is? Quantity II: The CI on a certain sum of money for 2 years at 20 % per annum is Rs. 8800. Then the principle is? A box contains 7 black balls, 5 pink balls and 4 yellow balls. Quantity I: If 3 balls are drawn randomly, then the probability of getting at least one pink balls? Quantity II: If 2 balls are drawn randomly, then the probability of getting both the balls is either black or yellow? 1) Quantity I: Two caps taken randomly from the bag S. What is the probability of getting one red and one pink? 2) Quantity I: One cap is taken randomly from bag R, S and T. What is the probability of getting a black colour cap? 3) In bag Q, 25% of caps sold at 20% discount in which 33(1/3) % is red colour caps. Two caps taken without replacement, what is the probability of getting one red colour cap without discount and another cap with discount? 4) If x green caps taken out from bag S and added to bag T, in the same way 2x red colour caps and x pink colour caps taken out from bag T and added to bag S. One cap is taken from bag S and the probability of getting black colour cap is 1/6. Find the value of ‘x’? 5) Quantity I: Total number of black colour caps is what percentage less than the total number of caps in bag R? Directions (Q. 6 – 10): Each question contains a statement followed by Quantity I and Quantity II. Read the contents clearly and answer your questions accordingly. 6) Quantity I: The shopkeeper sold an article at 10 % discount on marked price and he gains 20 %. If the marked price of the article is Rs. 400, then the cost price is? 7) Quantity I: A and B started a business by Rs. 4800 and Rs. 6400 respectively. A invested only 5 months and they divided their shares after a year. The ratio of profit of A and B is 3 : 8. Then how many months B invested the money? 8) Quantity I: Ravi can swim at 10 km/hr in still water. The river flows at 6 km/hr and it takes 6 hours more upstream than downstream for the same distance. How far is the place? 9) Quantity I: The SI on a certain sum of money for 5 years at 8 % per annum is Rs. 7500. Then the principle is? 10) A box contains 7 black balls, 5 pink balls and 4 yellow balls.